Now that the confusion is out of the way, let’s talk about some food. Congo has a culture of food stretching since it has been inhabited for over 80,000 years, but colonization by the French and Belgians has influenced the cuisine as well. There is typically a big emphasis in the meal on a starch, such as maize (corn), cassava, yam, or sweet potato. These are typically served with a sauce or protein such as goat, fish, or chicken. December 30, 2016 edit: With some great advice from Elena, we learned that peanuts are less frequently used in Moambe chicken then we thought. In fact, the moambe IS the Palm oil. Keep reading through the comments below or jump down for a recipe that Elena was kind enough to share. For our first Congolese dish, we’re going to do Chicken Moambe (also known as mwambe, nyembwe, among other names) adapted from Margarita’s International Recipes. It is a simple and delicious dish to get you introduced to the tasty cuisine of Congo. It’s the national dish of both the Congo as well as the DR Congo Like the French Coq Au Vin, we’re making a hearty stew where chicken is simmered for a short time to cook and a rich sauce to go with it. We’ll start by quartering a chicken, drying it well with paper towels, and searing it briefly in palm oil. Palm oil is the most authentic type of oil to use here and is becoming fairly easy to find. Amazon has some great Nutiva Organic Red Palm Oil that is perfect for this, but your local cooperative or health food store should have something similar. I also like red palm oil because it has a high smoke point at 450F and is a very healthy oil with lots of carotenoids (cancer fighting properties), antioxidants, and Vitamins A & E. Peanut oil also has an equally high smoke point and would work well as a fairly authentic substitute. So you want to get a heavy, preferably cast-iron Dutch oven blazing hot with your red palm oil and sear your chicken quarters on both sides until they’re golden brown, about 4-5 minutes per side. You’ll have to do this in batches and I recommend wiping out the Dutch oven with paper towels after each batch and adding new oil each time. Set the seared chicken aside and reduce the heat to medium-low. Sauté two diced onions in the same Dutch oven slowly until they’re golden as well, about 7-10 minutes. Add 3 cloves of pressed garlic, stirring constantly, and cook just until you can smell it, about 30 seconds. At this point, you want to dump in a 6 oz (170g) of tomato paste and keep stirring – this will stop the garlic from burning. Keep cooking the paste until the color darkens slightly, about 3 minutes. Taking this time really helps to develop a rich, savory, deep flavor base. Once that is ready, add a 14.5oz (411g) can of diced tomatoes (I prefer Muir Glen Organic Fire Roasted), 1 in (2.5mm) grated ginger root, 1 teaspoon of red pepper flakes, 1 cup (237ml) of water, and salt to taste (about 1 teaspoon) and mix thoroughly. Add the chicken back and bring to a boil on high heat. When it’s starting to boil, cover and reduce heat to low and simmer for 20 minutes. After 20 minutes, pull off about 1-2 cups (250-500ml) of sauce and mix very thoroughly with ½ cup (125g) of natural (preferably organic) peanut butter. This will make it WAY easier to blend the peanut butter into the rest of the sauce. Return the mixture to the Dutch oven and mix well to combine. Cook uncovered until chicken breasts and thighs reach 165F (74C). Taste sauce and adjust the seasoning to your preference. And that’s it! Quick easy and simple. 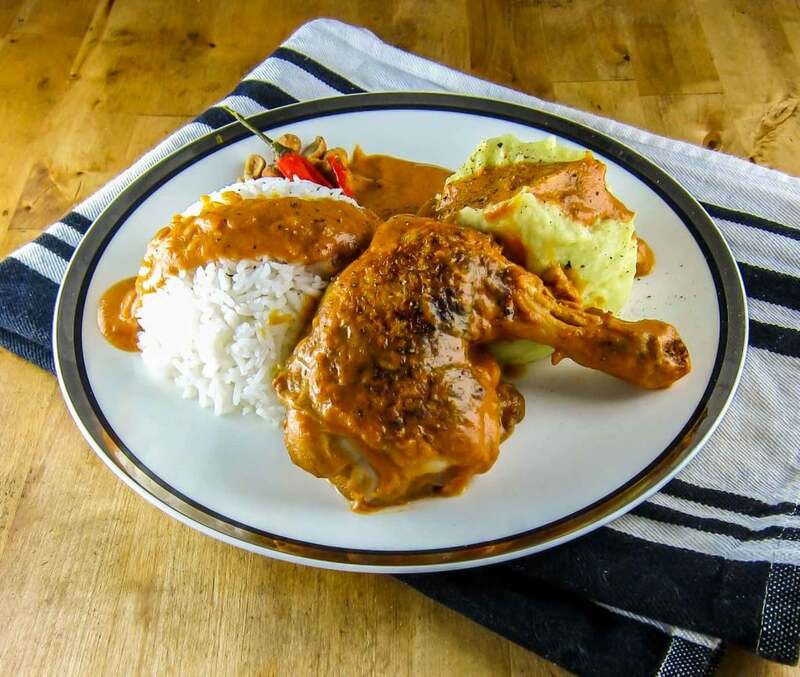 Serve the chicken with rice and fufu (a puree of white yams or sweet potatoes) or fried plantains, spooning the sauce on top. Let me start by saying that Moambe chicken is absolutely delicious. Rich and savory base that is enriched by the peanut butter – it really rounds out the dish and smoothes out the acidity of the tomatoes. It also helps thicken out the sauce and give it a very pleasant, thick body. 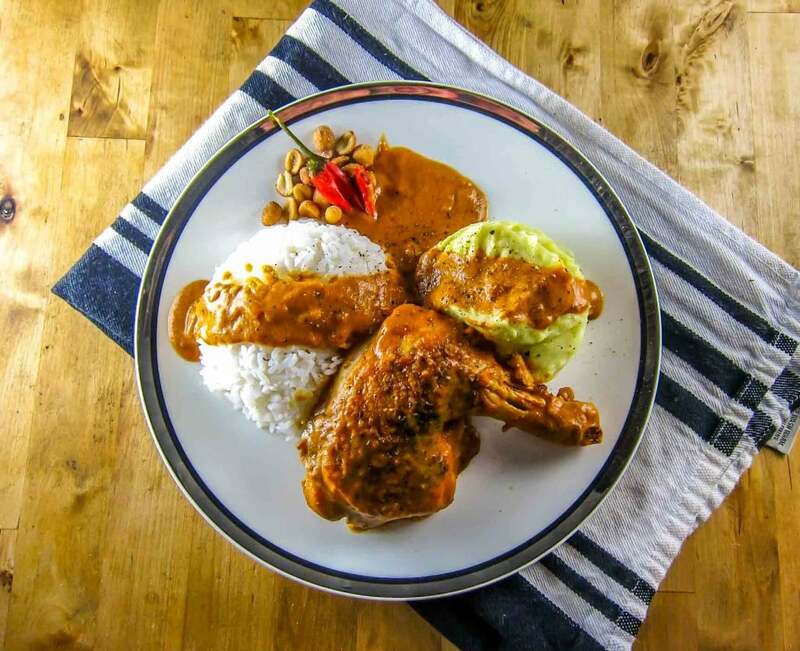 The chicken comes out super tender as well since it receives gentle treatment in the simmer and monitoring the temperature prevents it from becoming overcooked. We enjoyed our chicken over rice and fufu, and the sauce worked perfectly together with everything. Being a fan of peppers, I’ll kick-up the heat next time I make it – this sauce lends itself perfectly to hot chilies. Beyond that, I wouldn’t change a thing, though this sauce would go very well with roasted squashes and tubers as well. Tried this recipe? Let us know what you think about it and comment below! Mozambique: Matapa - delicious green stew with shrimp and peanuts! That’s a lovely recipe but not moambe. Thanks for you feedback, I appreciate you taking the time to look and comment. What would you do differently to make it closer to the mark? Well not to be rude but you´re the one making a recipe and you didn´t do your research. Which makes me kinda sad. Congolese cooking is the mothers´ cuisine, it´s how some of us remember where we come from, when we are born elsewhere. Anyway Moambe is not ever peanut based, it can be added but it is not the base. Palm butter or cream are not just the base for the Moambe, they are the Moambe. It needs to cook/boil for quite some time with some stock (I add a good bunch of fresh thyme) since it´s only done once the oil can be creamed of. (Use cheap cubes for your stock I use cheap beef, you need the excess salt) That´s why some make the sauce before and use the oil it exudes to fry the chicken since it´s palm oil, better yet it has been infused with the sauces´ flavors. As for the tomatoes I sometimes add a can of concentrate ( Is that the same as your paste? I live in Belgium so I have no clue :-)) but that´s optional. As for peppers I have used our African ones and chilies I prefer the African one in the Moambe even if I don´t like spicy food and that stuff burns. I cook the entire pepper in the Moambe and take it out once the flavour and spice to my taste. Thank you again for your thoughtful reply. I really do appreciate your feedback! Am I understanding your instructions correctly? Thank you again for your advice. My pleasure. I use this( https://goo.gl/images/IaTcc2 ) there are several brands. Its about 800gr, when it comes out its hard like butter or animal fat. To avoid rambling I´ll just tell you what I do step by step. -Sweat your onions (on medium high) (2 big ones or 3/4 smaller ones) in some palm oil with good amount of salt. – Once done add a handful of tied together twigs of fresh thyme. -Lower the heat a bit and add the entire can of moambe. You will see it is hard and has a shallow orange colour. You now add about 3/4L off water and two cubes of stock. Or until the water almost covers the moambe. -While the moambe melts you have to stay by your casserole to make sure the onions etc. don´t burn. Once it has melted make sure to stir anything lose that might have stuck anyway. Add water until it´s like brown soup. (you can´t add to much) Now if you like hotness you can add an entire pepper/chili whole and let it boil along. For less spice add it later. -Cover don´t let the water evaporate!!!! – Let it heat up to a good boil. After about 45 min you can lower the heat to medium and let it thicken a bit. -With the thicker consistency (A bit like the sauce in your recipe above) partly cover and leave on a soft boil for about 45 min. Pay attention don´t let it get to thick just yet, add some water or cover as needed. -The smell of the moambe should have changed now and you should see or start to see oil floating on the surface. Now be careful this splats terribly and leaves horrible stains and even small burns. -Lower the heat to get a softly! bubbling sauce. Uncover your sauce and skim of all the oil, be careful not to take any of the sauce along it will burn. Put it aside and use to fry your chicken. – Fry your chicken until it´s nice and golden it doesn´t need to be cooked through. 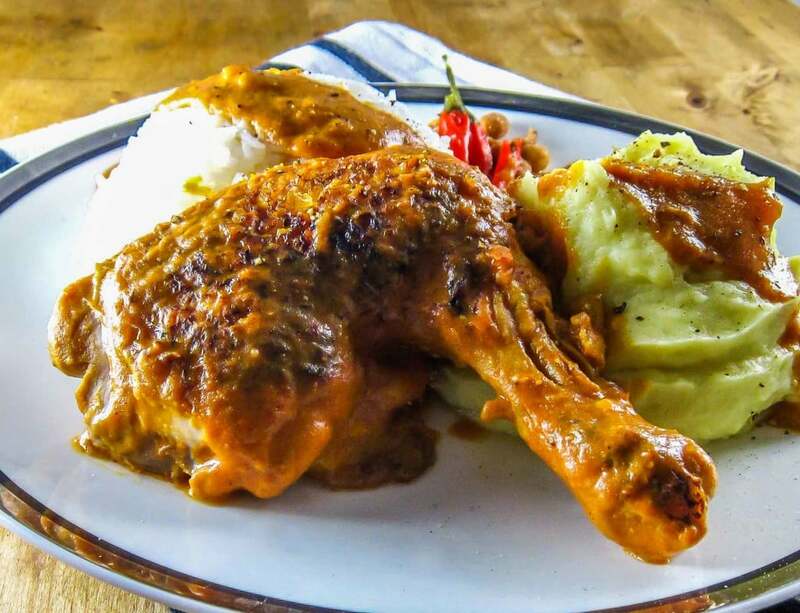 -Once fried you can add the breasts directly to the moambe (taste for salt and pepper now) and let it cook softly until the sauce has a thick consistency and the breasts have fallen apart. -For thighs or bone containing meat it´s better to let the sauce boil by itself a bit longer to avoid bones floating around in the sauce. Unless you don´t mind. I rather like the taste the chicken bones add. And maggi is fine just be aware if they are for 1/2L or 1L. Cause it needs a lot of salt but maybe not that much. Now this is the fastest way I know to make good moambe. You can do it faster but I find it tastes best when it has been on the stove all day. Once everything is done I tend to leave it on the lightest of simmers for the rest of the afternoon. Served with rice, Saka Saka/Pondu, fryed Bananas/Plantains and sweet potatoes, the red ones, american I think. I hope this has clarified everything. Happy holidays and a happy New year. Thank you very much for writing again! I will put a message at the top of the post that will link down to the to your instructions. 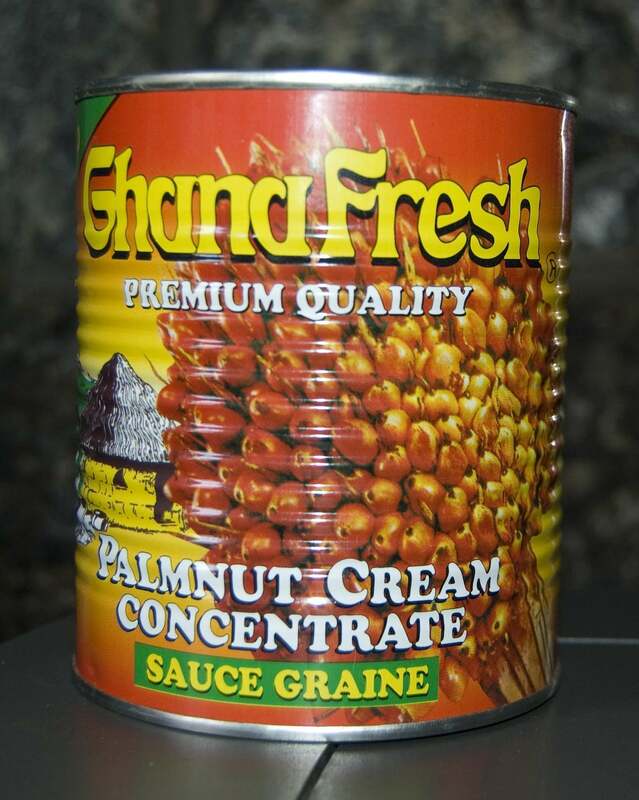 I can’t wait to get my hands on some Palmnut creme sauce and try it myself! I’ll post some pictures when I can do that. Thank you again for your thoughtful contributions and Happy Holidays and Happy New Year to you as well!